If you’re one of many runners out there who refuse to step out on the road or trail without a do-it-all performance device tracking your ever move, you’ll be pleased to know Garmin has rolled out updates to its Forerunner GPS watch lineup, including the Forerunner 220, and the Forerunner 620. Set to replace the existing 210 and 610 models respectively, the Forerunner 220 and 620 feature a more fashion-forward design, combined with significant performance improvements. Both the entry-level 220 and the more advanced 620 are lighter and less bulky than the pervious models, and they are both loaded with similar common features, including a color display. Both watches come with an optional heart rate monitor for tracking, well, your heart rate, and each one is loaded with an accelerometer, pace alerts, auto pause, and training plan support. The 620 features additional Wi-Fi functionality, and offers other advanced features like a recover advisory, and race predictions. Available now, the 220 has a price tag of $250 ($300 with heart rate monitor), while the 620 comes in at $400 ($450 with heart rate). 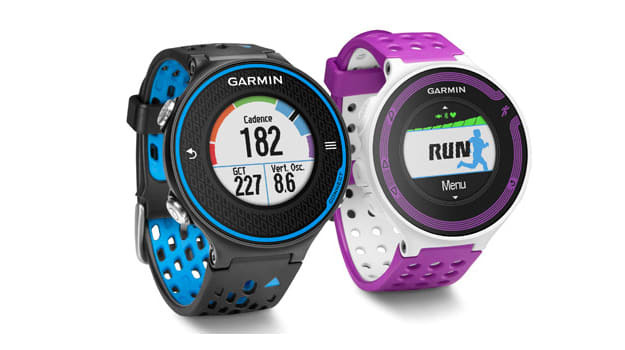 Check out Garmin for more information. Check back with Sneaker Report in the near future for a performance review on the GPS watches.